Replace or Upgrade your factory HID bulbs. Bulbs may look slightly different in appearance from above photos depending on color temperature you choose. How do these bulbs differ from the HID bulbs that came with my car? These bulbs are identical to the HID bulbs that came with your car at less than half the cost. These bulbs will last just as long if not longer then the factory HID bulbs. The only difference is now you can choose the color you want. Either stick with the OEM 4300K color temperature or spice it up with an exotic blue hue or sharp gold. 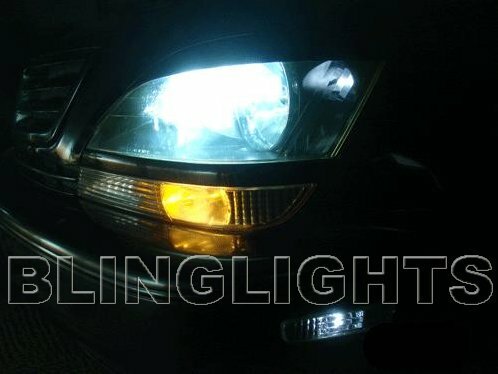 Does BlingLights carry spare parts if one of the parts were to get damaged in a fender bender? BlingLights has been on ebay and the net since 2001 Replacement parts if needed are in stock at everyday low prices. Accepted payment methods; credit or debit cards, googlecheckout, paypal, bank or cashier’s check, and money order. All payments must be in US currency and no personal checks.